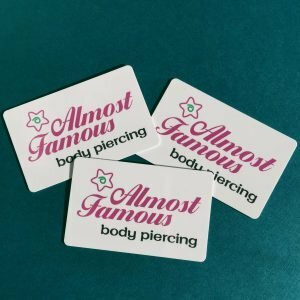 At Almost Famous Piercing, we know how important it is to find the right gift for everyone on your holiday list. Piercing shops have grown in popularity by leaps and bounds in the last several years, meaning you probably have at least one person on your list who would love some new body jewelry, piercing care products, or even a gift card for a new piercing. Here are some great gift ideas for the holiday season. Sturdy steel and fanciful titanium are two of the most popular options for nostril jewelry. Simple steel studs inset with small gems make a statement and are perfect for anyone who wants to dazzle. Titanium or steel hoops are very popular and easy to wear. They can be purchased in a variety of sizes, suitable for nearly any nostril piercing. 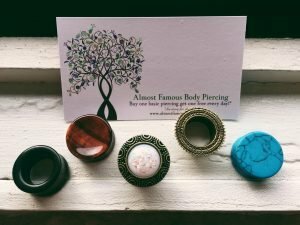 From externally threaded, jeweled plugs to tunnels with a rainbow of gems around the edges, natural plugs and beyond, we have some of the hottest jewelry for stretched ear piercings. Stretched piercings are an excellent way to show off individuality, and having a variety of different plugs is always welcome. We carry an extensive line of plug hoops, the perfect addition to any hollow plug. Giving the gift of variety this holiday season is easy with our great selection both in our stores and online. 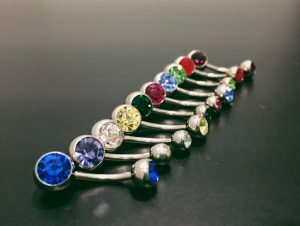 We offer a wide variety of navel jewelry, from dangling multi-bead options to gems inset in steel curved barbells, and so much more. Great jewelry for a navel piercing is a must, especially for fashion-conscious ladies and gents who like to have the right jewelry to match every outfit and occasion. 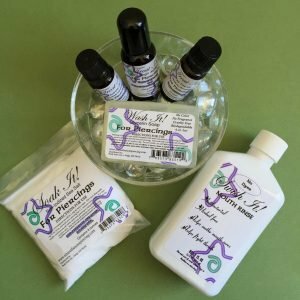 If you know someone who’s just had a piercing done, or you’re planning on giving them a gift card for a piercing in our shop, we recommend that you also take a look at our aftercare products. They make great stocking stuffer ideas for adults on your holiday gift list. Jewelry tools can be incredibly helpful to anyone who has piercings and prefers to change their own jewelry. Captive bead rings and other types of jewelry that can be difficult to change out can make the experience less-than-pleasant. 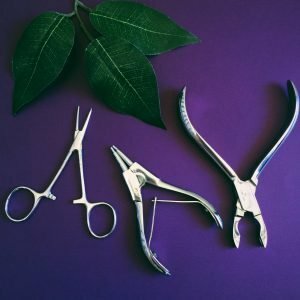 Our selection of opening and closing tools, as well as mosquito tools and dermal top changers, can make it much easier to be versatile and creative with body jewelry. Don’t forget that jewelry sizes are expressed by more than just a gauge; you’ll also need to know other dimensions like length or diameter. If in doubt, a gift card is recommended. For your health and safety, we do not accept returns on body jewelry once it leaves our stores, so it’s far better to be safe than sorry. We want our customers to know they are the only ones who have worn a specific piece of jewelry! A new septum clicker for a septum piercing makes a perfect gift! Clickers come in several styles and sizes, so if this is a gift for someone who hasn’t picked out something specific, a gift card will come in handy so they can make their own choice. When you get a new piercing, the jewelry we use is longer to allow for swelling. Shorter/smaller sized jewelry for a healed piercing also makes a perfect gift! When you give a gift card, the person purchasing the jewelry gets a free change out to make sure their new purchase is a perfect fit! Whether you’re buying for someone with eclectic tastes or someone who’s spiritually invested in the piercing experience, we have great holiday gift options. 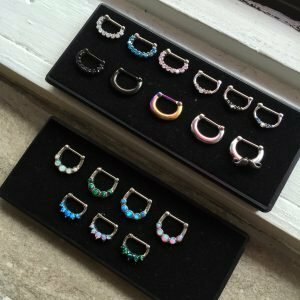 We carry unique jewelry, like hangers that can be worn with or without ear tunnels, Studex earrings for those with pierced ears, and a variety of different styles, colors, and materials for every piercing enthusiast. Visit Almost Famous Body Piercing today!